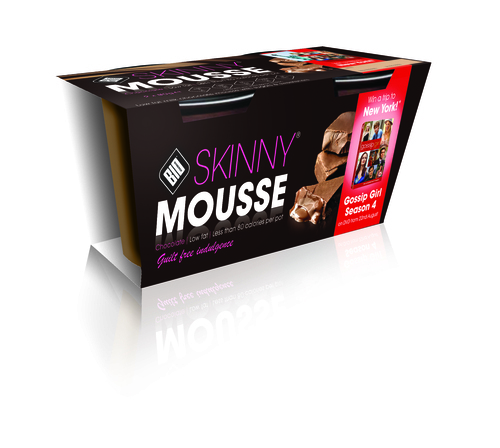 The new guilt free indulgence Bio-Synergy Skinny Mousse will hit the chillers in the Dairy aisle at the start of July! This low calorie dessert is enhanced with chromium which contains naturally occurring amino acids which helps suppress your sugar cravings. Bio-Synergy Skinny Mousse comes in two delicious flavours Chocolate less than 80k/cals and Caramel less than 50k/cals , both of which are low in, fat, sugar and carbohydrate. This mouth wateringly tasty treat can be eaten every day without feeling like you need to hit the gym for a week! Each delicious mousse is an excellent complement to any meal, as well as after a workout or as a low calorie snack. Perfect to fit into a healthy eating regime. Bio-Synergy Skinny Mousse is launching with a promotion with Gossip Girl Season 5 to win an exclusive trip to New York! Bio-Synergy is the UK’s Number One sports, weight management and functional drinks company. Well known for Bio-Synergy Skinny Water that has come out top in countless surveys carried out by national media – it was voted number one in a ‘no diet, diet’ test for News of the World’s Fabulous magazine, and scored nine out of ten in a weight loss poll for the Daily Mirror. In addition, it has been voted top product by Women’s Fitness and Slim at Home magazine. This press release was distributed by ResponseSource Press Release Wire on behalf of Bio Synergy in the following categories: Health, Women's Interest & Beauty, Sport, Food & Drink, for more information visit https://pressreleasewire.responsesource.com/about.